The object called 'Oumuamua is an unusual object that entered the solar system in 2017. Two Harvard scientists (Abraham Loeb and Shmuel Bialy) have written a paper speculating that the object might have been a probe designed by extraterrestrials. This paper has triggered much coverage in the popular press. We do not have a photo of ‘Oumuamua, but its brightness owing to reflected sunlight varied by a factor of 10 as it rotated periodically every eight hours. This implies that ‘Oumuamua has an extreme elongated shape with its length at least five to 10 times larger than its projected width. So 'Oumuamua may be only five times longer than its width, which would make it merely pickle-shaped rather than cigar-shaped. A pickle-shaped object is not particularly strange, and many asteroids and comets have such a shape. There are actually three reasons for thinking that if 'Oumuamua was sent by extraterrestrials, it could only have been sent by very stupid extraterrestrials. I will now list these reasons. Reason #1: only very stupid extraterrestrials would build a spacecraft that has the tumbling motion that 'Oumuamua has. 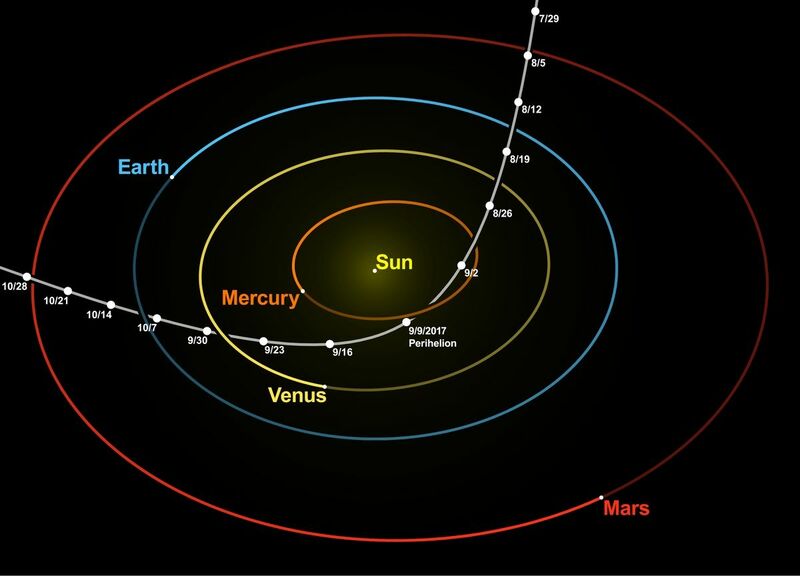 A scientific paper tells us that 'Oumuamua has “clear signs of a tumbling motion.” The object is apparently tumbling end over end, like some bottle spun in the “spin the bottle” game. It seems that only very silly designers of a spacecraft would design a spacecraft that had such a motion. If an object is tumbling end over end, any rocket thrust that it had would not be consistently applied in a particular direction. When the US sends rockets to Mars or the moon, they never have a tumbling motion. Instead, such rockets keep consistently pointing in a particular direction. We can imagine a conversation between stupid extraterrestrials that might result in such a spacecraft. Extraterrestrial worker: Uh, boss, what kind of stuff should we include with that rocket we're sending to the stars? Extraterrestrial boss: Make it look snazzy! The shinier it looks, the better. Everybody loves a shiny spacecraft. 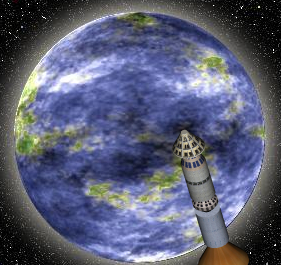 Extraterrestrial worker: Should we make sure the rocket always points in the direction it's trying to go to? Extraterrestrial boss: Why bother with such details? Reason #2: only very stupid extraterrestrials would build a spacecraft that did not head towards a life-bearing planet in a solar system it entered. 'Oumuamua came nowhere close to Earth, and showed no signs of changing its motion to come closer to Earth. We can imagine a conversation between very stupid extraterrestrials that might have resulted in such a design. Extraterrestrial worker: Uh, boss, should we have some kind of deal where our rocket moves closer to a life-bearing planet if it finds one in a solar system it enters? Extraterrestrial boss: That requires programming! You know guys on our planet aren't smart enough to do that kind of thing! Extraterrestrial worker: So the rocket should just go into a solar system, and hopes it gets lucky by passing near a life-bearing planet? Extraterrestrial boss: Sure, why not? It's not like there's lot of empty space in a solar system. Reason #3: only very stupid extraterrestrials would build a spacecraft that did not transmit radio signals after entering a solar system. Sending radio signals is an easy way for a spacecraft entering a solar system to send a message back to its home planet announcing what it found. Scientists made a careful check to see whether artificial radio emissions were coming from 'Oumuamua. But no radio signals were picked up. We can imagine a conversation between very stupid extraterrestrials that might have resulted in an interstellar spacecraft without a radio system. Extraterrestrial worker: Uh, boss, should we have some kind of deal where our rocket radios back to us what it discovered? Extraterrestrial boss: Dummy, you haven't thought things through. Doing that means we'd have to point the radio transmitter antenna in the right direction. Extraterrestrial worker: So why not just have the antenna move to the right direction? Extraterrestrial boss: Because then we have to figure out what is the right direction when the spacecraft is who-knows-where pointing in who-knows-what direction. None of us is smart enough to figure that stuff out. Only a super-genius could figure that out! Extraterrestrial worker: So how about this? 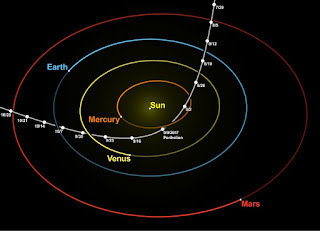 We'll just have the spaceship travel in random directions, and hope that it comes back to our planet long after it luckily passes by a life-bearing planet in some other solar system. Extraterrestrial boss: That's a great idea. I'm sure the spaceship will come back to our planet. It's not like there's lot of empty space between the stars. Upon hearing this hypothetical conversation, some readers will probably think to themselves that the expert minds on our planet are much wiser, and would never think something so silly as the idea that random changes applied over a long period would result in fortunate outcomes resembling the outcomes of precision engineering. The most likely explanation for Oumuamua is that it is a naturally occurring object such as an exo-asteroid. If it is a constructed artifact, it is most likely a fragment of wreckage or jettisoned material from a satellite, drone, or some such craft.